The final class of the SparkFun summer semester is tonight! Come join us for a class on selling your widget! I'm not sure if you've seen these little jobbers on the market. 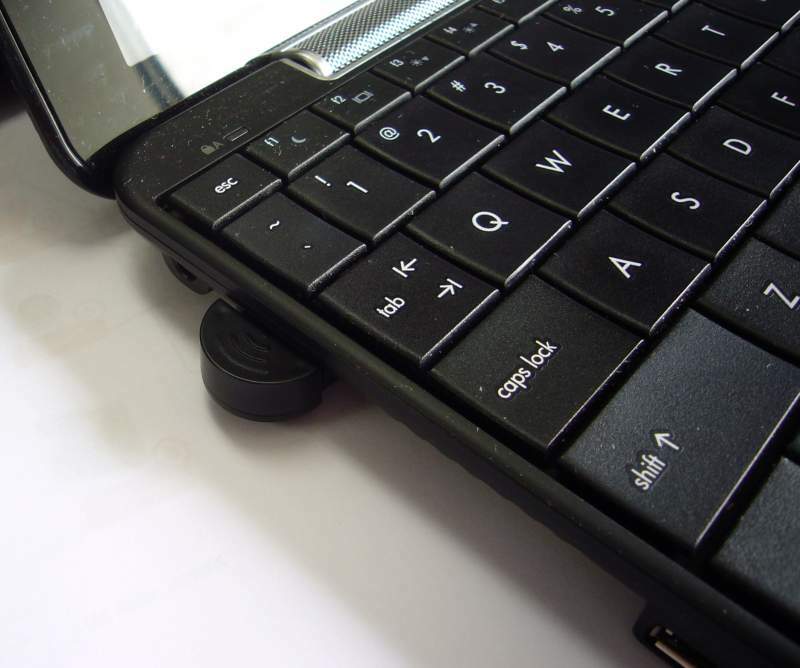 It's an itty-bitty Bluetooth dongle meant for laptops. Above, you can see the small nub sticking out of the side of my HP Mini 1000, which absolutely rocks, but does not have Bluetooth built in. Depending on where you buy, these little guys range from a few dollars to $50! But what is the world could be tightly packed underneath that little cover? They must have folded the PCB, stacked the dies, used a mechanical turk inside or managed some sort of magic. That's just amazing! I figured the entire thing would have been one potted glob of black resin, but with a handy razor blade, the housing split open surprisingly easily. That is one heck of a PCB trace antenna (2.4GHz). The engineering was surprisingly good! The PCB slides inside the small metal housing, that acts as the USB connector and doubles as an RF shield. Very sneaky. Here you can see the 12MHz crystal (for USB communication) and a simple 3-pin SMT voltage regulator (I assume 5V down to 3.3V). There is also a basic LED on this side of the PCB that barely lights up and can be seen through the smoky, semi-transparent housing. And here's the magical all-in-one Bluetooth IC! AS3620QA is the IC. Not sure how much this actually has built into it, but it is pretty neat! All wireless technology should be so easy! 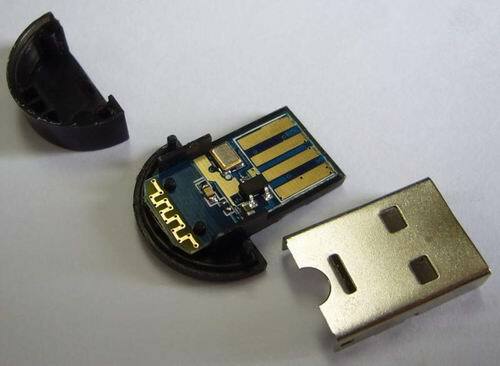 I would recommend using a USB Breakout board for that type of hack instead of trying to hack into these little guys. If you don't like the led light then simple coat the inside of the case with paint or a small piece of tape. No desoldering required! Or if you want some indication but the light is too bright then use something semi-transparent to cut down on the light output. If you don't like the led indicator then simply coat the inside of the plastic case with paint or a small piece of tape. No unsoldering required. Or if you want some indication but it is too bright then used something semi-transparent to reduce the light output. I would like to use it on a board which is running with 9V battery. can the on board SMT voltage regulator will handle 9V, is there any comapny to ask? Any idea on how to integrate this with arduino? 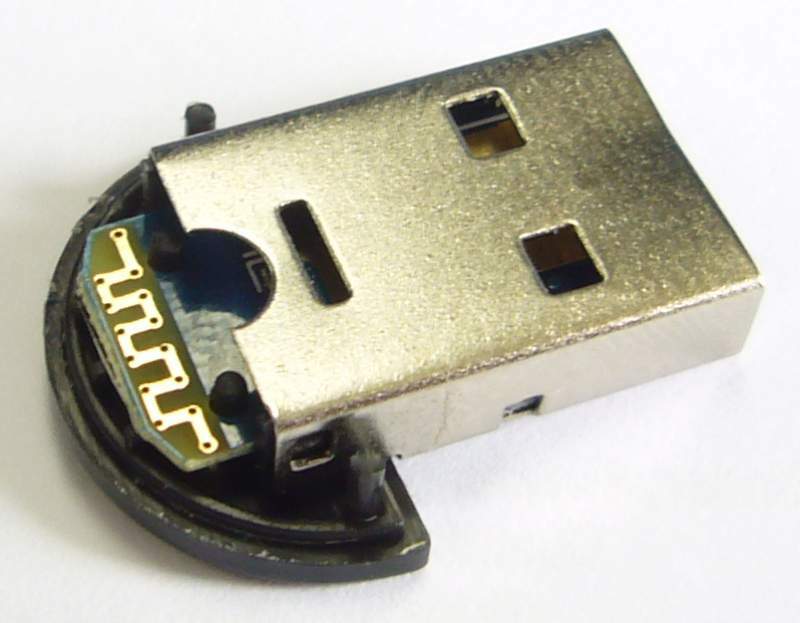 I mean, would it be easy to interface this dongle with a micro controller? Arduino BT costs U$90. This dongle costs U$5 with free shipping. Hi, I just now got myself an AT&T's unlocked Blackberry curve 8310 from US. Everything else works fine in India on Vodafone except the GPS service. I have tried placing it in all sorts of places, but all it does is "Searching for satellites" and it goes back to its original state showing everything as "0" (lat, long etc.). Has anybody been able to work with GPS on BB curve in India ? Would be grateful for any help provided. I was in Walmart recently and saw a dongle very similar to this bundled with a bluetooth mouse. 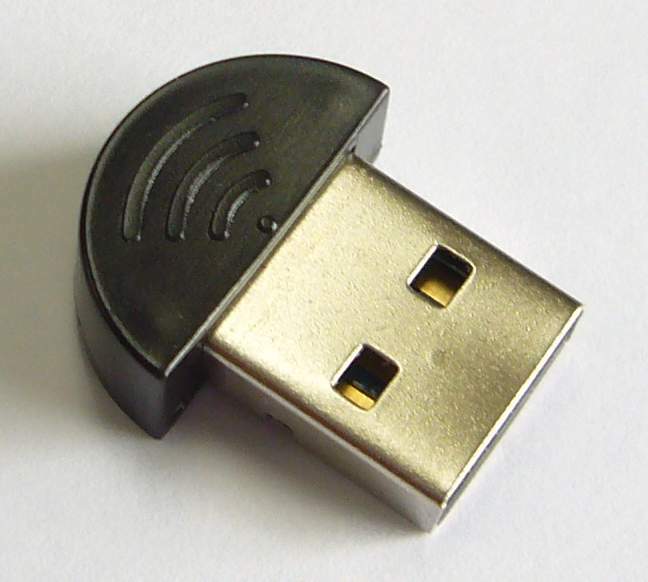 The dongle is square, with rounded corners, but it doesn't protrude any further than this one. I've used a similar sized adapter before, the GBU 421 made by IoGear. 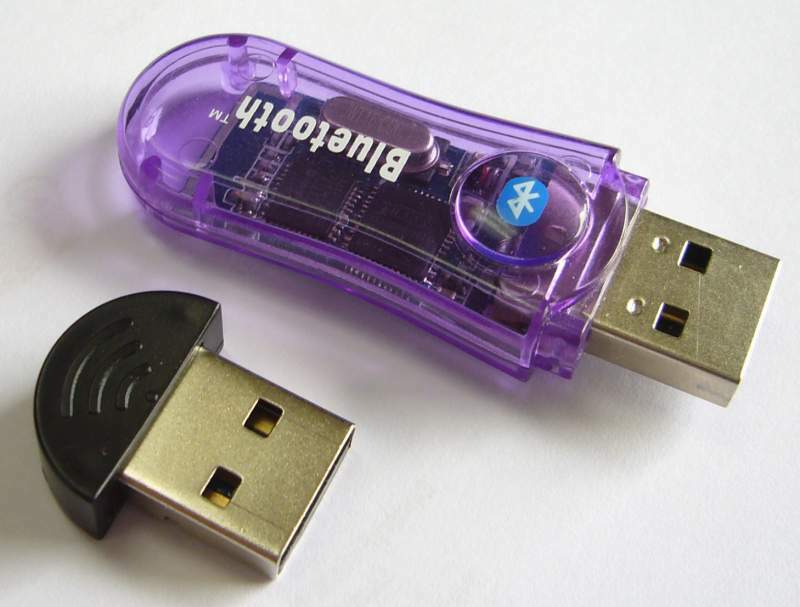 It works perfectly with Windows, Mac, and Linux for communication with the Wiimote using the default OS Bluetooth stack. No crazy Bluetooth drivers needed! 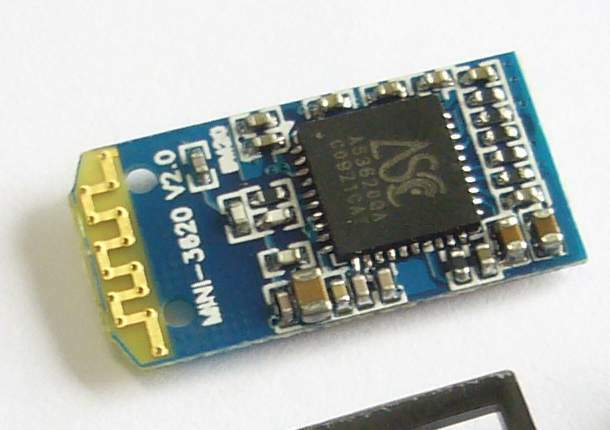 Is it just me, or does that Bluetooth board look hand-soldered? Funny thing, i ordered three of these dongles about 5 days ago. So I thought I would buy two of those cute little 16gb devices listed in your post and found that two cost ? 25 960.00 = 273.54052 US$. $273 is a bit steep even for that small package. heh Did I miss the us pricing or something? I got one of these a few months ago to communicate with my mobile phone. I soon opened it up just like Nate did here. Pretty neat huh? Importantly, it works with Linux. Annoyingly, the light flashes whenever it has power, which includes when I have shutdown my computer. So I have to pull it out whenever I go to bed. Hah! Bad blinky. You sure you don't want to just de-solder the LED? Won't take but a minute. or a piece of electrician's plastic tape if you don't want to open it up. I've notice a disturbing trend among devices - gratuitously bright LEDs. The blue ones are the worst. The blinking blue one on the wireless fob for Wii rockband is so fricking bright that you can read by it with the lights off and it continually distracts when watching the tube. I had to hack it. And the USB cell phone charger for my car has one that is so bright it's reflection is distracting at night. I'm e-taping my wireless router some time today. The ... eight ~150mcd clear Blu LED's do a good job of turning my room into a blinky disco when I'm heading to bed. I wish they did similar for Wifi - would breathe new life in to older laptops!